Because you're 'Gore'geous - the tickets arrived today ! Phew! They have arrived in our house, two pieces of thin card that bring a huge smile to my chubby face. 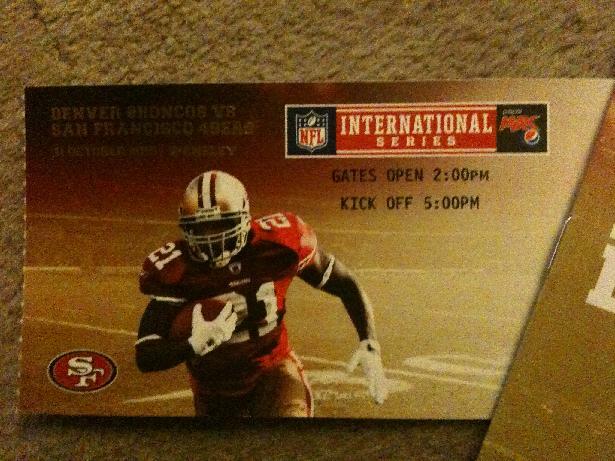 Yes my two tickets for the San Francisco 49ers v Denver Broncos are here and on my coffee table. Despite both teams travelling to a different continent to play their week 8 game, it is billed as a 49ers home game. With that in mind I was delighted to see 49ers workhorse running-back Frank Gore as the ticket star. I had a bad feeling that 49ers quarterback, and the man that will cost Mike Singletary his job, Alex Smith would be on the tickets. Gore is one of the hardest working running backs in the NFL, a player who plays with passion, guts and a nose for the endzone. The former Miami Hurricane has only managed one season without injury since he was drafted in 2005, but despite that he has amassed 6,032 rushing yards (at an impressive 4.7 yards per run) and 2,115 receiving yards, resulting in 42 touchdowns. In six games so far this season Gore has only managed three total touchdowns. This is not Frank’s fault, it is Alex ‘millstone’ Smith who has crippled the 49ers offensive production. With under two weeks until I get to see Gore in the flesh, I only hope the man handing him the ball is not a former #1 pick in the NFL draft (and yes that includes you David Carr!). 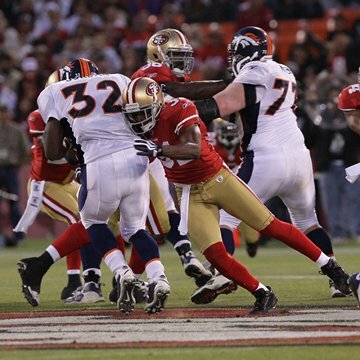 So it’s the Broncos v 49ers at Wembley in 2010 – Yuk! In 2007 we had the New York Giants team that went on to lift the Superbowl, In 2008 we had offensive fireworks as the San Diego Chargers and the New Orleans Saints trading touchdowns like they were right hooks in a ring, and in 2009 we were treated to future Hall of Fame bust owners Tom Brady, Randy Moss and coach Bill Belichick. In 2010 we have Kyle Orton and Alex Smith and two teams that have combined for JUST 2 playoff wins combined in the last 10 full NFL seasons (a 49ers Wild Card win in 2002 and a Broncos Divisional round win in 2005). Yes the 49ers have a stud running back in Frank Gore, and a WR with big ‘potential’ in the shape of 2009 1st round draft pick WR Michael Crabtree, but their defense is pretty grotty aside from Patrick Willis. As for the Broncos they have a Bears reject at quarterback, a Pro Bowl WR who seems to be a petulant liability (Brandon Marshall), a defense that ranked 26th in the league in rush defense. Bottom line this is my least favourite matchup of teams that will make the pilgrimage to London, England. When I say least favourite I mean in a 2010 exciting and meaningful game context. I do appreciate the history of both teams, having grown up watching Joe Montana, Jerry Rice, Tom Rathman, Roger Craig, John Elway, Steve Atwater, et al. I just have to say I am not exactly blown away by a Kyle Orton short passing game versus a similar activity delivered on the sacred Wembley turf. I have to admit I will pay extra attention to the free agency moves of the Mile High crew and the Goldrush fanatics, and their subsequent draft picks. I just have a feeling that unless both teams do some significant off-season roster pimping then we could be in for a rather dull 16-10 sort of game where it becomes a festival of field goals. Using an analogy from the wrong sport I do wonder if the NFL has scored an own goal with these two definitions of mediocrity. I wonder if you think like me and would have rather seen someone like the Indianapolis Colts up against the Green Bay Packers? This from a Redskins fan!